Now I know some of you will be looking at the cover picture and going “Beans and Peas!! They’re not paleo!!!”. While this is technically true as they are legumes, the argument about green beans, from what I’ve seen on line, is a grey area. My argument is they’re both delicious vegetables and in the end the greater variety of veg in our diet the better. As always the delicious pork is from Athleat.com, still highly recommend them as your meat provider. 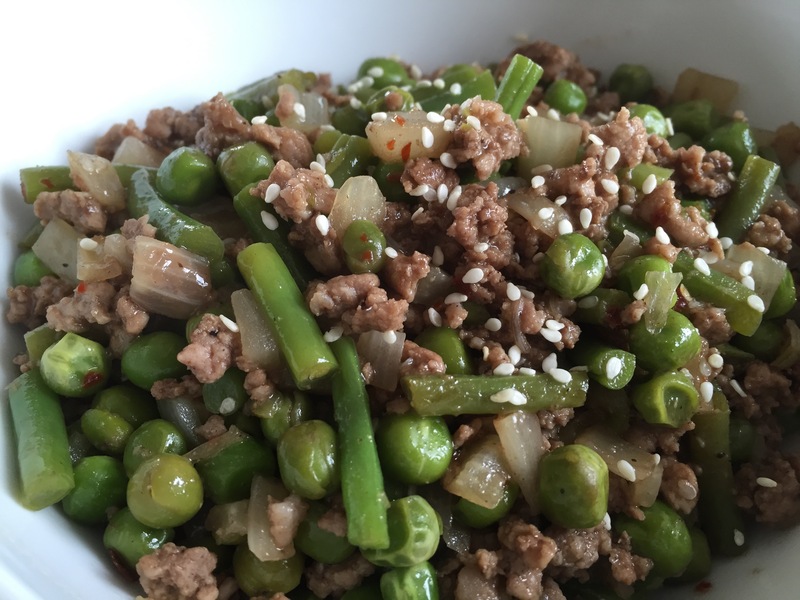 The recipe idea stemmed from a Ching He Huang Recipe, which I have previously adapted and blogged about, but I wanted to give it a green vegetable base instead of cauliflower rice. Plus I was trying to be a bit poetic, thinking about pigs in a farm, wondering round a kitchen garden, or something along those lines. Anyway, I came up with this recipe which I really enjoyed eating, though it serves 4 it just served me the first time I made it. Was too good. In a skillet or wok heat some coconut oil over a medium high heat. Once melted add the chopped onions and cook for a few minutes until they start to soften. Now add the chopped green beans and cook for another couple of minutes. 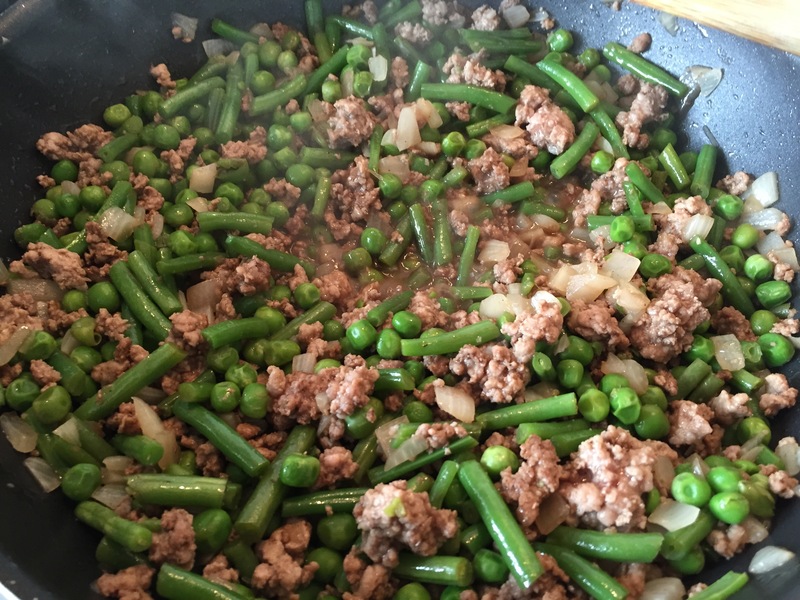 Once the beans start to look glossy, add the frozen peas directly to the pan (don’t defrost them). 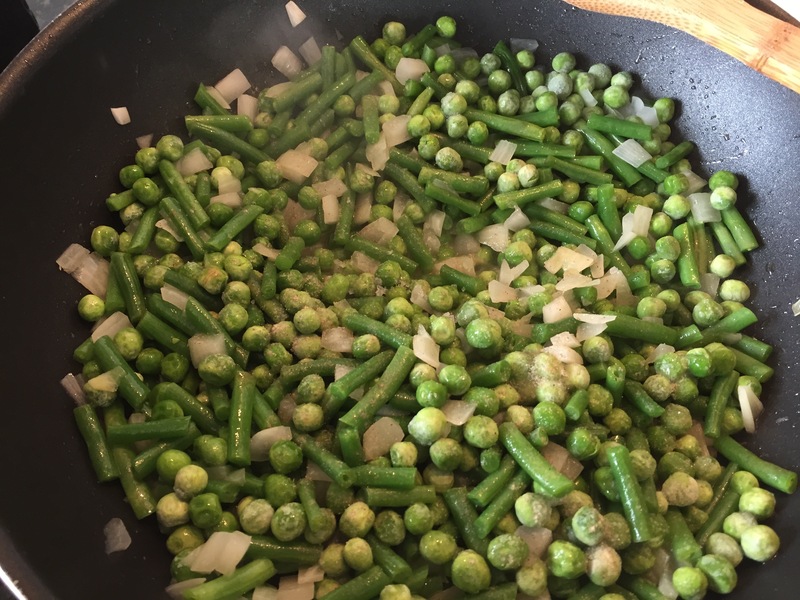 Putting the peas in frozen will add a bit of water to the pan to let the vegetables to steam. Now clamp on a lid and lower the heat to medium to allow the vegetables and onion to steam/sweat for about 3-4 minutes until soft. Now remove the lid and add the pork, breaking it up to ensure it is cooked evenly. Before the meat has completely cooked, add the coconut aminos/soy sauce, balsamic vinegar and around 1 teaspoon of sesame oil to the meat, along with some white pepper, salt and chilli flakes. Stir in well. Turn the high up to high and keep the lid off to evaporate off any excess water from the peas so you don’t end up with a soup. Keep stirring to ensure the meat doesn’t burn. Once the water has evaporated serve in bowls and sprinkle some sesame seeds on top for garnish, feel free to add more chilli flakes if you wish.